L-com Global Connectivity, a preferred manufacturer of wired and wireless connectivity products, announced today that it has launched two new series of outdoor-rated, high-flex Cat5e cables for use in industrial Ethernet connectivity applications. 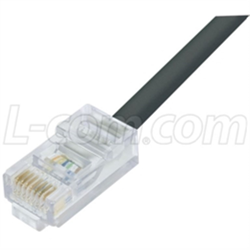 Designed for industrial or outdoor environments where typical Ethernet cables fail, L-com’s exclusive ultra-flexible Cat5e patch cables are built to withstand demanding environments and repetitive motion applications. The TRD855HFT-series cables feature a Thermoplastic Elastomer (TPE) cable jacket that is resistant to industrial oils, UV damage and weld spatter while maintaining a CMX flame rating. The TRD855HFP-series cables employ an economical polyurethane (PUR) cable jacket that is resistant to UV damage and water. “Our new high-flex, outdoor-rated industrial Ethernet cables are the perfect solution for outdoor networks where extreme conditions exist. These cables offer excellent resistance to UV sun light, oil, chemicals and weld splatter commonly found in industrial settings,“ said Dustin Guttadauro, Product Manager. In addition to eight standard off the shelf lengths, these cables can be ordered as custom cables with different lengths to suit specific installation needs. Both the TRD855HFT and TRD855HFP-series cables are in stock and available for immediate shipment.